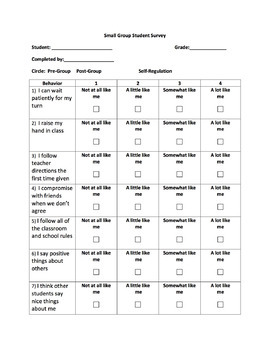 Assessment tool is for student self-report and teacher report on self-regulation skills. Teacher survey has option to add additional behaviors and these behaviors are then transferred over to the student survey. 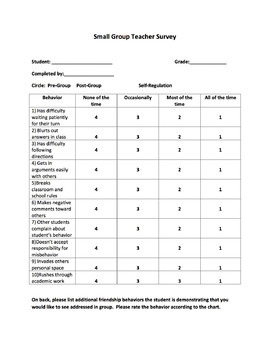 The assessment tool will examine the student's perspective and the teacher's perspective on self-regulation skills. The assessment is given at the initial small group and at the last group meeting to assess growth.